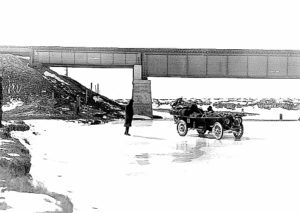 The Flyer crosses the frozen Medicine Bow River. A grand 7 course banquet was held at the Union Pacific Hotel complete with Perfecto cigars, followed by three kinds of wine. Inhabitants were sparse, with vast ranges of open prairie and occasional piles of rocks marking the final resting place of an unfortunate settler. 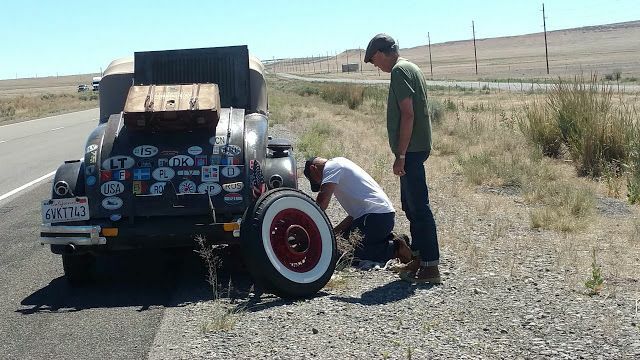 Ahh… the joys of roadside repairs! Never in a convenient spot, there is a lot to be said for traveling with a good spare. John has already used his first new spare. Tomorrow morning he will be getting a second new one here in Ely, NV. We decided to make an adjustment in our itinerary sticking with the original 1908 route, and not miss Ely on our way to Tonopah. It does mean that we will miss the Thomas Flyer in the National Automobile Museum in Reno, NV. However, we have all been fortunate to see it prior to this run. Conditions have been ideal for vintage vehicles, with clear skies and temps. ranging into the upper 80s* They are running fine, with a few problems along the way you might expect with vehicles 90 year old. After all, we have to remember that our very worst day will be far better than the very best day was in 1908!